Okay, um….WOW!!! I just, just, just found out about this new bookmarking site, and I am so very lovin’ it! What a phenomenally marvelous fantastically brilliant idea! Just look at that screenshot above….it explains everything and WOW!!! Oh, yeah…the name of the site is nkwiry (like inquiry…get it?) It is another online bookmarking tool (see previous post about other online bookmarking sites), but this one allows your students to be part of the collection and compilation of sites! I just created an nkwiry site. It took me about 5 minutes to create an account, choose a class code, create categories that are relevant to me, to add my students and create unique passwords for them. Then I spent a few minutes playing with the other cool features and, at the risk of being redundant, WOW! There is a class message feature called “class feed’. 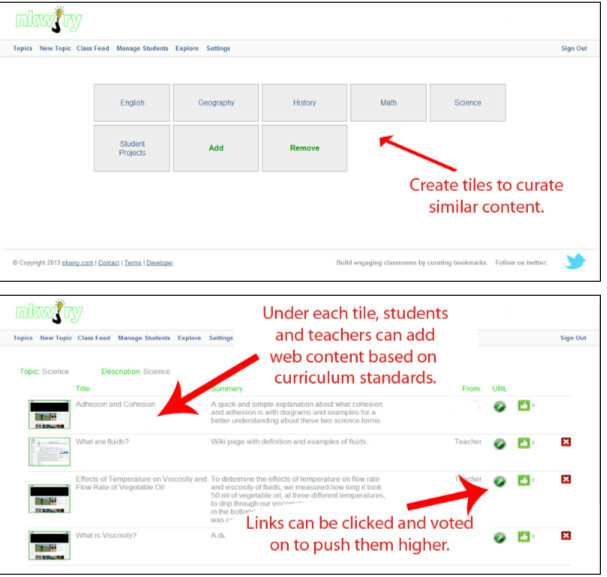 You and the students can post comments, questions, or topics to each other! Bonus! It would be fun to post bookmark collection challenges there (find sites for kids about rocks that have videos) or use it as a way for students to suggest new topic categories for the class nkwiry. Oooh…are you into that ‘flipped class’ thing? Why not post a topic and challenge students to add bookmarks about a topic you’ll be teaching NEXT WEEK! They’ll start learning before you start teaching, and you’ll have a whole bunch of online materials for your lesson plans! I also tried logging in as a student. They don’t have the ability to add or delete categories, but they most certainly can add bookmarks (sites) to a category! The student needs to type (paste) the URL, name the site whatever he/she wants, and add a simple description. It immediately appears as an available link, and it shows who posted it. Another cool and unexpected feature is that there is a “like” button so that other students can indicate if they like it or find it useful. The one caution I would advise is to have a serious heart-to-heart with your students about the appropriateness of their links…there is not a feature that allows teacher to pre-approve bookmarks/sites before they post. nkwiry isn’t all pretty and cutesy and primary school-ish, but it is an absolutely thrilling opportunity to engage your students in selecting the tools and sites that will guide their own learning. It encourages student involvement and shows that their opinions are valued and welcomed. It’s meaningful and purposeful collaboration! With monitoring, of course, it can even decrease your workload and make your online bookmarking undeniably more extensive! nkwiry…love this tool! * As always, I’d love to hear your feedback. What grade levels could/would/should use this? Will you use this? If you do, share how it’s working for your class and let us share in your success! You can comment here on the blog, @kerszi on Twitter, or ‘like’ My Primary Techspiration on Facebook. Online Bookmarking: Saving Your Sites! For years, my district provided us with something called eBoards. Each teacher got one, and it looked like a virtual bulletin board with square sticky notes. We could categorize by tabs, subjects, grade levels…and then subcategorize with as many sticky-notes as we wanted within each category. I spent about 12 years building mine, and it had THOUSANDS AND THOUSANDS of my favorite collected links, sites, and attachments. This year, the district is getting rid of eBoards. Holy link-loss, Batman! I’m going to lose it all! Years & years of work, collection, organization…gone! No wait – there’s hope! It’s definitely going to take some time, but I’m going to transfer all of those valuable little categories of links like my sanity depends on it (which it probably does!) But I’m going to do it the smart way this time. I’m not transferring to whatever the new platform/website/staff webpages the district gives us! What if they choose another option a few years from now? I’m not doing this again. So….I am putting all of my cherished links….in the cloud! This screenshot doesn’t even show my FAVORITE part: When you begin installing Draggo (which is free, of course), it prompts you to install a Draggo button (in Chrome). Now, at the top of my screen, just under the URL bar, is a permanant button that says SAVE TO DRAGGO. Whenever I am browsing the web and happen to notice something that I want to save & bookmark, I just click that little button and it automatically saves the site to an ‘inbox’ in my Draggo account. The next time I log on to Draggo, it shows me all my tagged items in this ‘inbox’ and asks where I’d like to categorize them! This is such a huge timesaver and a major bonus! 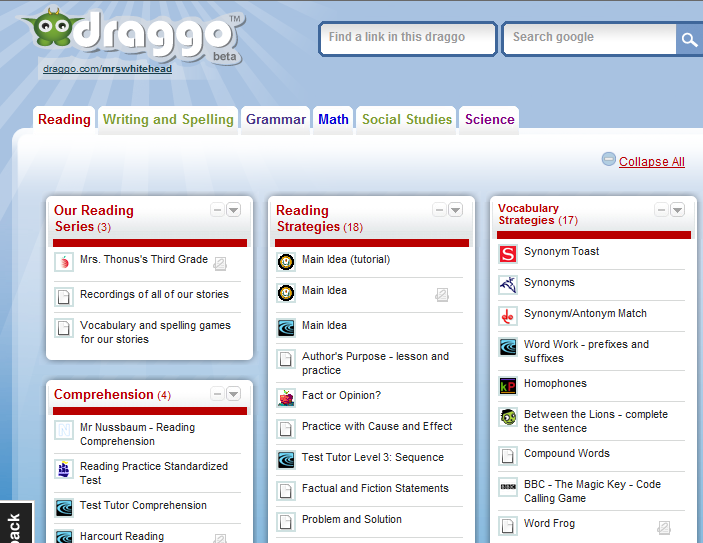 I also just like the way the site looks – the tabs, categories, links, and a password that lets students access my draggo but not edit it. I also like that I can set up a few “private” tabs – visible only to me. Please click “share” if you know of other teachers (or any kind of human being) that might like to know about these 3 online bookmarking tools. *** Note: another great organizational bookmarking tool that’s popular is called LiveBinders. I’ve gotten a lot of very nice resources from existing public LiveBinders, and it’s definitely worth checking out! Let me know in the comments (or on Facebook) if you want to learn more, and I’ll do a separate post about it!